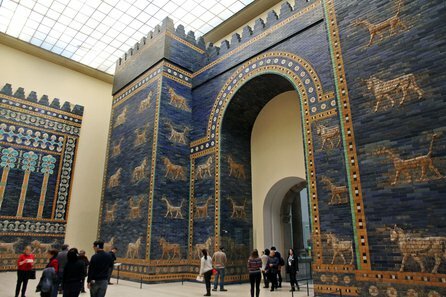 This is a photograph of the Ishtar Gate, taken at the Pergamon Museum in Berlin. The tiles are the actual tiles from the original gate, which had been found in ruins. The tour guide explains how tiles were taken to the Pergamon Museum and reassembled. This allows you to walk through the gate and experience the grandeur. Read more about the Ishtar Gate and see more pictures in this extensive Wikipedia article.